Live jazz and the rustic atmosphere are my favorite things about El Acontista. And the food isn't bad either. You already know how to find a date, even what to do on a date, and maybe you found some tips on this site. Now all you’re missing is the 10 best places to take a date in Medellín, something I will tell you all about now. It’s Valentine’s Day weekend, and while speed dating in Colombia won’t make this list, you’ll find many great options. I’ll cover everything from restaurants to parks to live music, with a few other places mixed in to give you a good variety. I’ve left out movies because I think that’s too cliché. Same with salsa dancing. And I didn’t include the theater, because I know not everyone who reads this post speaks Spanish. For those who do, check out the Teatro Metropolitano. Otherwise, here are 10 places everyone can enjoy, regardless of language skills. It took me nearly 3 1/2 years to find El Acontista. What a shame. I live in Bogotá now, so I can’t enjoy all the time like I would if I still lived in Medellín. Every Monday, there is live jazz. My friend Jen and I went this past week, to see Pablo Alzate y Su Bluesboy Trio (pictured above). My only regret was not staying until the end, but I had already promised my old roommates I would watch The Walking Dead with them. I enjoyed the music before I left, and even the atmosphere, something that seems straight out of a ’60s movie. The pizza was pretty good too, and the other dishes people around us were ordering looked appetizing as well, so much so that I thought about eating two dinners that night. I settled on dessert instead, the Oreo cheesecake, while Jen got the cheesecake with strawberry toppings, and we shared and mixed the chocolate syrup on my plate with pieces of her pie, and the strawberry syrup from her plate with pieces of mine. You have to spend at least 10,000 pesos (about $4) if you want to go on jazz night, but that shouldn’t be a problem. I’d pay more to listen to live jazz, and we did. The entrees, desserts, and — I almost forgot — bottle of wine was 76,000 pesos (about $35), unbelievably cheap for such a great experience. I might have to come back, just for this. I think of Ciudad del Río like a gourmet buffet. You have a lot to choose from, a lot of it very good. Do you want to eat a great meal? You can get that at Bonuar. Maybe just a nice cup of coffee and a little privacy? Check out the loft space at Cariñito. Or how about some culture? There’s the Museo de Arte Moderno. A relaxing day at the park? Parque Lineal Ciudad del Río works. I almost made this No. 1 on the list. Almost. Syborite is probably Medellín’s best-kept secret. Even my friend Viviana, who loves places like this, did not know it until I told her about it. They have great wine here, a big plus for me, and a lot of options to pair with it, from cheeses and meats to delicious sandwiches. I found out about it from some friends who live nearby. Those are the regular customers, the ones in the neighborhood. If you live nearby, or even if you don’t, you might want to join them. At Sushi House, you can take a class or sit on the floor at one of the low tables like they do in Japan. I’ve always liked the idea of cooking classes for a date. Unless you’re Hitch, you probably do too. The best place to do this in Medellín is the sushi class at Sushi House. Or, if you just want to eat, and not prepare the sushi yourself, you can sit on the floor at the low tables, the way they do in Japan. I suggest going on a Wednesday. It’s three rolls for the price of two on that day. Most Colombians like to dance. But instead of salsa — nice but unoriginal — or reggaeton — tacky and unoriginal — take your special someone to do some tango. Envigado has the perfect place: La Cabaña del Recuerdo. They have live music on Wednesdays and Thursdays, but beware of the table minimum. If you want to sit, you have to spend at least 100,000 pesos (about $45). As long as you’re fine with that, you’ll have fun. I loved Parque El Salado as soon as I saw it. So it should be no surprise that it’s No. 1 in my story on the Best Parks in Medellín. At Parque El Salado, you can do some hiking, swimming in the river, zip-lining, picnicking, or just relaxing and watching for the monkeys that sometimes hang out in some of the trees. I need to go back, soon. For good food in a classy environment with a beautiful view, Delaire Sky Lounge is the place to be. They have good appetizers, good pizza, good everything. If you order mixed drinks, don’t be surprised if you pay a lot. But if you stick to beer and food, your tab shouldn’t be too bad. And because of its location in Centro Comercial Rio Sur, near other nightlife spots such as Kukaramakara, Delaire can be just the beginning of a fun night out. Like Ciudad del Río, you have lots of options if you visit this area just outside Medellín. You can take the Metrocable to Parque Arví first. Maybe hike some of the trails or rent one of the free bicycles. Then you can take the blue bus to Santa Elena, where you can indulge in traditional Colombian food at almost every restaurant. If you have time for more than just a day trip, I’d recommend staying the night. 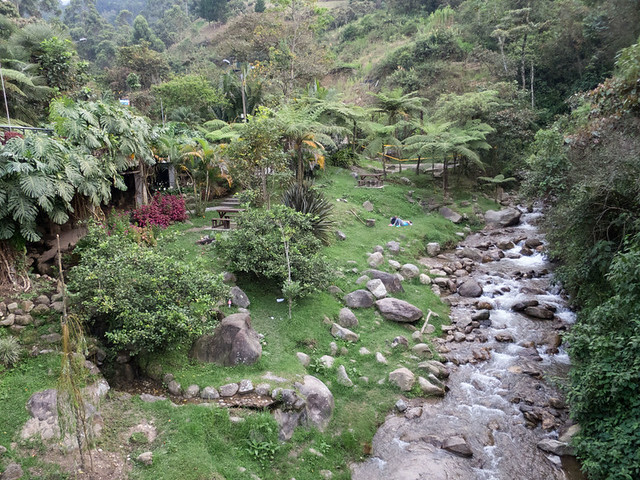 At Hostal Rancho Rueda Libre, you can get up close with nature and have a nice getaway from the bustling city scene down in the valley. I love brunch and French food, and Brie Bon has both. I think it’s the best French restaurant in the city and one of the best places for brunch in the city as well (a list I’ll unveil next month). That gives you two options for a date. 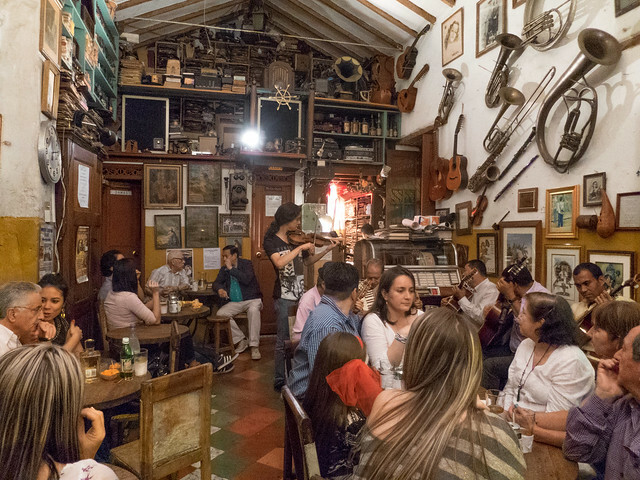 You’ll also enjoy the beautiful setting along Via Provenza, one of the prettiest streets in the city, and you’re near Parque Lleras, which gives you lots of options to continue your date if it’s going well. If you and your date are looking for adventure, paragliding is a good way to go. All you have to do is take the bus to San Felix from the Terminal del Norte, just a 45-minute ride. Once you get there, or even before, you can call Dragonfly Paragliding (300 333 0800). It’s owned by two brothers who will show you a good time. If you have a fear of heights, like I do, this is one way to conquer it, or at least overcome it for a half hour.